So anyway, this week I realized I am only a few weeks away from my first quilted art workshop at G Street Fabrics in Rockville Maryland. April 12th! Yikes! It’s almost here and I’m not ready! Well, I know what I’m going to teach, because I have given this class once before, and I have the kits figured out…but I frantically found the bag I had left over from the last class to see if I have enough pieces to make any kits at all for the class. I put together five finished ones ready for use, three that are partially finished, and I need ten altogether. Yes, it’s just a little class of not more than eight students and not less than three. Sew I make ten kits..eight for the students, one for me to use in demonstration, and one for oopsies. A frantic text to my friend Mei-Ling, who is the Bernina dealer there and with whom I am running the class, solved the problem of missing pieces. She has the thread. She has the needles. I shopped my stash and found I have the fabric. I can print off the handouts. SO all I need now is time. Well, in truth, I can do all the things I have left to do for workshop 1 in one day. I’ll tackle that early next week. And then I must put together kits for 2, 3, and 4, but they are less difficult and take less time. There is also the Easter banner my friend Anita and I are making for the church. It seemed to be progressing very slowly for a while, and I was feeling a little frustrated, but yesterday we got the main top or front together and it is looking fabulous. We just need to stitch down the embroideries, which are large sets of lilies I edited from an old design and stitched out in the hoop. There are two sets and each set took about five hours to stitch out, but they look really good. There were some odd skips of stitching and missed outlines, probably resulting from the wrong setting on pull compensation and other editing errors on my part, but I took them to the machine and free motion stitched the repairs and corrections…so they look great. We have them glue-basted on to the banner and all we have to do is zig zag them on with monopoly. The cross, the lamb, and the little applqued banner at the top are all on. And yes, I will be taking pictures and posting them here for you to see. So I have been trying to solve the problems related to making instructional videos for posting on YouTube and to give a little taste of some of the things in my Bernina V8 book, Twelve Skill-Building Projects for Bernina V8. I also want to develop a series of videos on quilting using both my Bernina Q20 sitdown longarm and my Bernina domestic machines. So I had first to learn to use the software…that was and is a challenge. But I have succeeded in making several test videos now. Then I couldn’t get the software to connect to my microphone, but today, I finally figured out where to find the setting on my computer to allow this to happen. Eureka! The first voiced video showing how to take a simple design and turn it into a really pretty wreath design on Bernina V8 is really quite funny, I am thinking I will leave in all my mistakes and backups and fixes along the way because it shows how to overcome things and is much more amusing too. In the end I managed to crash my computer and will have to take it up again and edit the pieces together. Gosh I wonder how hard it is to add additional RAM (random access memory), which is what I need to not crash the computer. I thought I had plenty in my current machine, but when it gets into making videos coupled with advanced software like Bernina, it isn’t quite enough. Oh sigh. Anyway, when I finish this first demo I will put a link here so you can find it if you are interested. Even if you don’t have Bernina software you may find it funny enough to watch it. Sew now I’m going to work on the sample for my fourth workshop, which is on ruler work with a sitdown machine. I am so looking forward to getting the workshops prepared, the Easter banner done, and getting back to making quilts. Sew happy everyone! Stay tuned for future videos. Also, would you like a podcast about once every couple of weeks? I think it would probably be just me talking to you, but once in a while might include a guest? Let me know. Tags: Don't give up without trying something else first, Having fun in my studio, I love comments., What is that crazy B.J. doing now? This has been a busy and interesting month so far, and the end of the month promises to be just as unique. First of all, I want to tell you about the background fabric piece pictured above. I spent some time (more than a forty hour week) painting this design I wanted to use for a background, to which I will be adding a lot of objects, including trees, rocks, train trestle, train, steam clouds as appliques. But I painted it digitally in Corel Painter and sent it off to be printed full size by Fabrics on Demand, which has a wide selection of fabrics and does a good job. I’ve used them before. So after about a week I got word that they had printed the fabric and shipped it. I waited, waited, decided I would have to contact them because it had been weeks and no fabric. In the meantime, we had a snow week, with an 11 inch snow followed by very cold weather. Then we had a thaw. Just as I was about to contact the company, my son brought in a wet package that he had found on the side of the front porch under a bush. Yes it was my fabric. It had apparently been blown off the porch under the bush and covered in snow and ice. We might not have found it until even later if the cold weather had continued. The fabric was in a plastic envelope and carefully packed, but it was totally soaked. I washed it in the washing machine, thinking that I normally would have hand washed it with Synthrapol detergent, since it was a custom printed piece. So I wasn’t sure how it would come out. But it is totally beautiful. The colors are strong and lovely and the piece is clearly not going to bleed or shrink now as I use it in my quilt. My friend Anita was amazed at the piece. She is an artist herself but is new to the fabric art world. I could tell she is excited to consider that she might be able to turn her art into a piece of fabric. She would have to take a good picture or scan of her art since she doesn’t work digitally in order to get it into fabric in this way, but that works too. 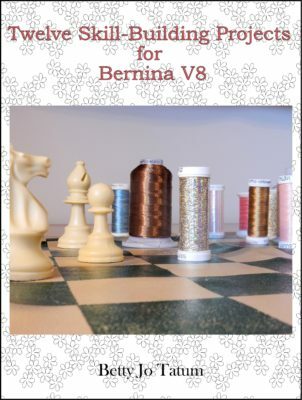 Okay readers, I have been working full-time for several weeks now just to update my Ten Skill-Building Projects for Bernina V7 to a new book for Bernina V8, and I have finished the basic manuscript, sent it to my Beta readers, and designed the cover. I am looking to have this out by the end of February. So if you have either V7 or V8, I think you will find working through the projects of these books will provide you with a solid understanding or improvement in your use the software to go forward and make some wonderful in-the-hoop embroidery designs. You can make what you want for your projects. These books are designed so if you work through the book the later projects build on what you learn in the earlier projects. Additionally, you will end up with some fun small items…mug rugs, a color wheel, a needle book, and a bunch of nice designs to use in other ways. I’m very happy to be more or less finished with this Bernina software books project. I have more or less been working on this for several years now. It’s not that the projects are that hard, it was the difficulty of figuring out what should be presented and in what order to help fabric artist that still has the program in the box or has only used it a little because it was a little confusing, or that may not know how much is really there. It is an amazing software…almost magical. It has tools to help you get where you need to be, but it does not do a good job of telling you what tools are there. The reference manual is well presented, but you may not know what you don’t know and you don’t know where to look. The books are not exhaustive in covering all the tools, but they are enough to give you a real feel for what you can do with the software. Just as I neared the finish of the first book for V7, Bernina came out with the updated V8, so I put it aside. But my dear friend Mei-Ling Huang, who is also my Bernina dealer, encouraged me to go ahead and put out the V7 book, because there are a lot of sewists out there still using that software. And then she pushed me a little to also write the updated V8 version. I truly don’t think these books would be finished without her encouragement. Sew now that I have completed these two projects and have gotten my fabrics for the next several show quilts and workshop samplers and kits, I have to straighten up this studio! It’s a mess! I’m so excited about the work I have in store for the future. I made a list of things and put a date I wanted to get them done by, just so I can figure what I need to work on next and next and next. Let’s get to quilting and embroidering! I also am thinking about what book I should write next. I have found that self-publishing through Amazon KDP is not too difficult for me to manage. I want to get what I know out for people to use. I have learned a great deal in the past sixty plus years of sewing and art work. Maybe the next one will focus on surface design and embellishment. I have won several prizes at major shows based on my work in this field. But I have to get to quilting first. Just need…to….quilt! Sew happy everyone! There’s a fabulous bunch of tools and supplies out there to make some wonderful fabric art. 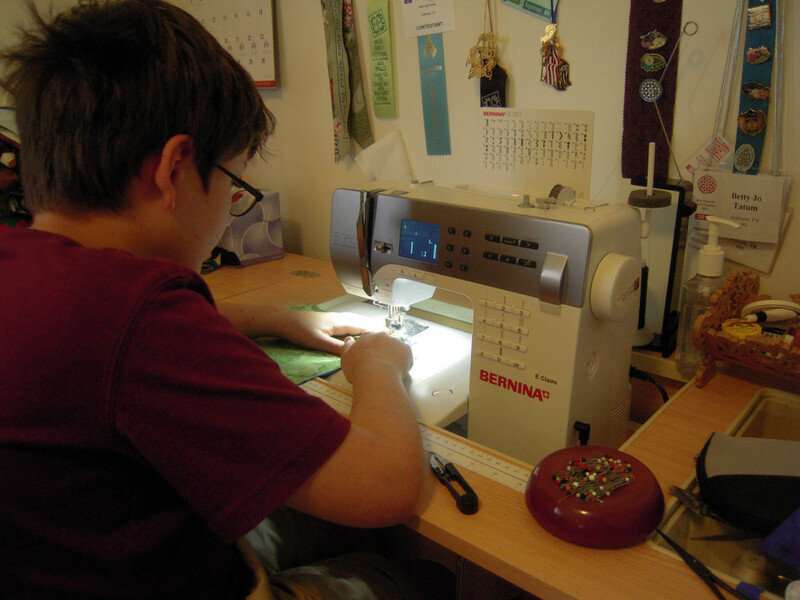 Teach someone to sew or quilt or try something new yourself! Tags: Don't give up without trying something else first, Encourage new sewists and quilters, Encourage old sewists and quilters, Having fun in my studio, I love comments., Scary and exciting all at once, What is that crazy B.J. doing now? I love this picture from early in the twentieth century. 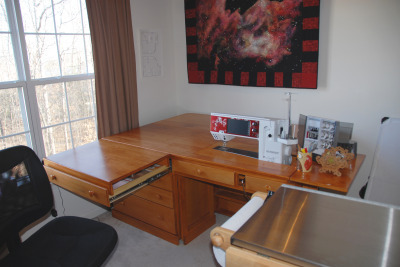 Periodically in some of my Facebook groups that are focused around quilting and sewing I see a surprising number of people who have sewing or quilting machines they are truly afraid to use. Now I can see how this might happen. Today’s machines are often technically advanced, big, powerful, and fast. That can be very intimidating, especially if you fear making mistakes on your creations or breaking your machine. Maybe you are afraid of sewing through your fingers. Maybe you think you can’t possibly figure out how to use that advanced machine. These are legitimate fears, but you can take steps to stop them in their tracks. Read the manual of your machine. Yes, read it even if you have been sewing for 65 plus years, even if it is a somewhat simpler machine, or even if it’s boring or you don’t understand it, but read it anyway. Later you will remember that there is an answer to a question you have along the way in your manual so you can go back and look it up in the index at the back when you need it. You don’t have to remember it until you need it. You just have to remember that there is an answer there. Sometimes you may find you do things differently with this machine than you did with your mom’s machine you learned on. If you don’t find the manual, they are often online free for download. Get yourself a small notebook and make notes as you go. Keep a record of your steps, the settings on your machine you used for what. Even after 65 years plus of sewing, I still keep notes on projects I do. It’s so handy when I want to do it again, or have gone out of my project to hem my new jeans and need to get back to where I was on my project. I have also taken those notes and made spreadsheets or lists that I can print out and stick on my wall for reference. Take advantage of the tools your machine has. These tools include both the functional tools built into your machine and the accessories (specialty feet, magnifying glass, differing sole plates, optional threading aids, cleaning aids, pinpoint lasers, and other things). Yes, you have spent a lot buying your machine…so spend a little more and get those specialty feet as you need them for particular projects. It makes your initial investment truly worth it. Realize that even if you paid a lot for your machines they are not perfect (nothing manufactured is, really! ), but usually they will work if you do things right. They may have some things that might go awry from time to time. So join those Facebook groups where you can ask what other people do about some things, look in the manual near the end where they have the section usually entitled “Troubleshooting”, go on YouTube to find if it is something you can fix yourself (if you have a Bernina, take a look at Bernina Boys on YouTube), contact your machine’s online support (I can’t tell you how many problems I have gotten solved this way without having to lug my machines to the dealer), or yes, lug your machine to the dealer and get that problem fixed. But start with a cleaning, check on the tensions, and change the needle…maybe even change the thread. And if you are not getting that nagging problem fixed by your dealer, contact the manufacturer (using the online support) and ask them what to do. Remember, they WANT you to be happy with your machine. If you are happy with your machine you will tell others about it, and they will buy one. If you are happy with your machine, you might buy another one that has another function (I have three Berninas). But I will suggest that if you buy a solid advanced machine and LEARN HOW TO USE IT, you will almost certainly be amazed at what you can do with it. Realize that, surprisingly, sometimes it is the thread, the needle, and something amiss with your machine. But normally problems can be solved by cleaning the machine, changing the tensions. using a different sized needle, or just replacing a needle that may be slightly bent or have a blunt end. Learning to use your particular machine is like learning to play a new instrument. You HAVE TO PRACTICE!!! Yes, practice a little bit frequently and a lot once in a while at the very least. Practice even if you have sewn for 65 plus years. Practice is just that. You are making a practice piece…something that may even end up in the trash. But this can be really fun. Remember that..it’s ultimately fun! 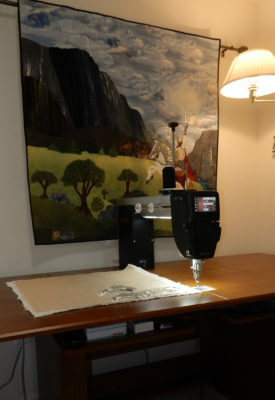 My Bernina B350 named Edith Claire (E.Claire) after Edith Head. Plan out your project in small steps. Prepare your pieces (make the markings you need to make). Be sure you have the right threads, needles, backings, battings, stabilizers and interfacings on hand. These things make using your machine so much easier. My Bernina Q20 named Fritz. And finally, if you have a computerized machine, make sure you keep it updated with the latest updates. Sometimes the updates are put out primarily to correct some bug they have discovered and so you won’t have that problem happen to you. Sometimes they add new stitches or new functions. Find out how to do this in your manual. Here I have attached a pdf file to print out a small practice project for free motion quilting. It is sized so you can print it out with normal letter sized paper and tape it together. Then use it as a marking guide for your fabric. I developed it for a FMQ workshop I will be teaching at the sewing machine department at G Street Fabrics in Rockville, Maryland in October of this year. I’d love to see you there. There are only eight spots for students, so call them (ask for sewing machine department) and reserve your space. It’s about organic fmq for fabric artists…no fancy feathers, but lots of fun. 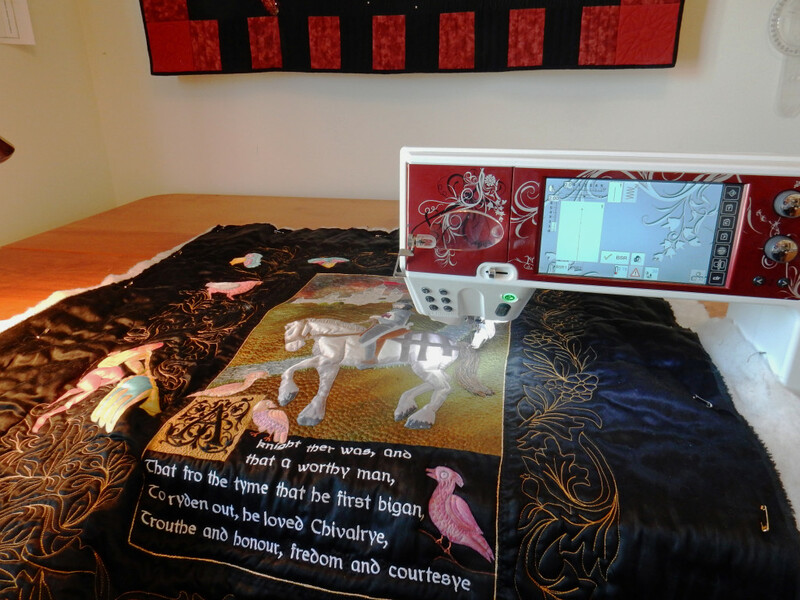 I’m also teaching a class on 22 September in Machine Applique for Fabric Artists, and one in October on Feed Dogs Up Quilting for Fabric Artists. Sew the picture above is my completed quilt and I got the judges comments back yesterday. They have marking grades on standard criteria. It fared very well, getting all top marks (E for Excellent) except for degree of difficulty and that was S for Satisfactory. I don’t know which judge had which comments section, though I do know that they weren’t Pepper (a friend of mine), who just signed it. After looking at it objectively, I happen to agree with the comment about the rocks and plan on adding some additional quilting and maybe a litle more highlighting before I send it out again. Not sure I agree on degree of difficulty, but seeing some of the other quilts there I am pretty pleased with these marks overall, which is rare when I get my judges comments back. I am a little puzzled about the batting a bit too puffy comment, but to each his own. Maybe it had to do with the rocks. When I am done with a quilt I like to look back at the original concept and see how far away I wandered in the making of the quilt. Here is the finished concept art, though I did go through a number of other versions along the way. And here are some detail photos of the quilt. I hope you can see all of the quilting. I had loads of fun with that turbulent sky full of characters, I have a Pegasus in this shot. Go up and look at the full quilt and see if you can find the Phoenix, the small flying bird, a starry kind of symbol like I used in the corners, and the little bit of free motion feather design at the corner near the raven. I also free motioned and straight ruler stitched the explosion of light (is that a sun? 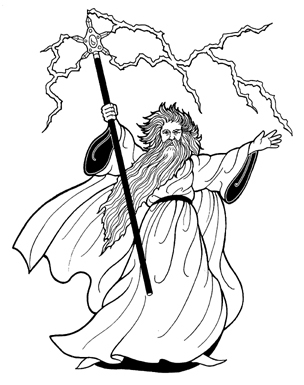 I think so) behind the wizards. And here is detail shot two…on this you may think you see a row of flying geese, but that’s not what they are. In my mind’s eye these are a row of flying pterodactyls! Hahaha. I hopeyou can see these, I know it’s kind of hard to see. Also pay attention to the border. This quilt is the first one where I used ruler work extensively. I used a strip of paper that was the exact length of the border and folded it until I got the divisions perfect (no math method) and marked the grid on the border, then used my rulers to quilt the design without additional design marking. Then I just bubble stitched where it needed filling. I was pleased with the results. I will tell you that the biggest challenge was coming up with the figures. I started with prepared for dye cotton fabric and marked the figures on with a simple Fons and Porter dark marking pencil. Then I colored them using Neocolor water soluble paint crayons and brushed them with water. After that I ironed them dry, thereby heat setting them, and then I placed a bit of wool batting behind the dragon and stitched the outline and the scales. After that I used some oil paint sticks to burnish the scales of the dragon a little. 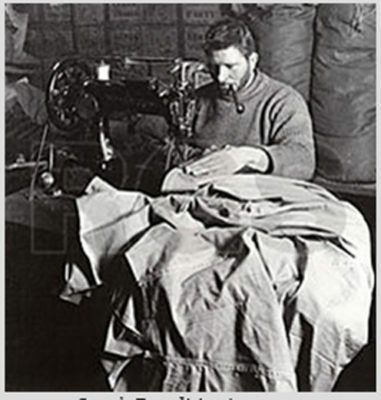 Then I thread painted their garments with Superior metallic threads using my BerninaQ20 longarm sitdown. Finally, I appliqued them to the quilt top. After sandwiching them, I quilted the figures sections with Superior Monopoly thread, but that was the only place I used monopoly. I didn’t want to interfere with the thread painting I had done, but they needed quilting for depth of character. I wonder if the judges realized the difficulty involved there. Perhaps they did. And finally, here is a very good picture of the quilt hanging in the show that my friend Cathy Wiggins took. 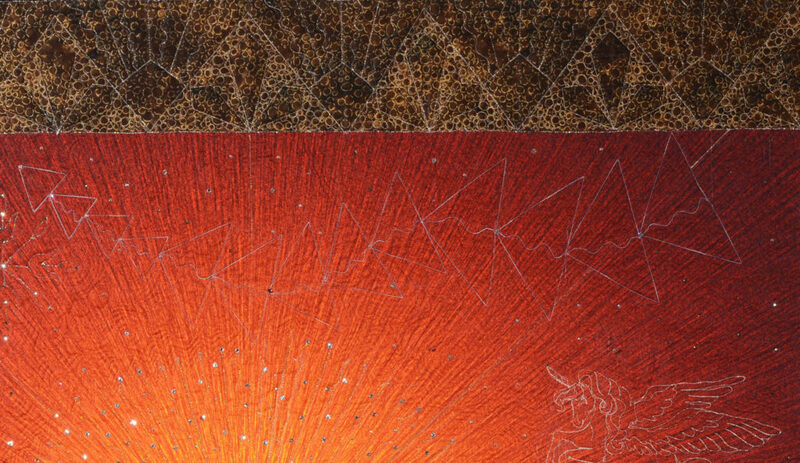 I think it shows the quilting clearly…in fact the show had it lit just perfectly so the quilting showed well. The quilts at the quilt show were unbelievably magnificent. I do think Wizards’ Duel stands up well in such a show, even if it didn’t receive a ribbon. As I said, I plan on adding some quilting and highlighting on the rocks section and entering it in other shows. Maybe it will place after that. It’s very hard to place in such a show. The MAQF is becoming a very important and popular show and for good reason…it is fabulous. Mei-Ling and I attended the fashion show too and spent some time viewing the wearable art competition section at the show. We were so inspired by this that we decided to try to make a joint entry for the wearable art next year. Mei-Ling is a small beautifully proportioned woman and we will make it to fit her. More on that much later. I came home to find a chipmunk had invaded our home…he came in about an hour after I got home. That is another story that is still going on . He’s still here and in one of my studio rooms. My studio is on the upper level of my town home where my bedroom also is. It consists of two small bedrooms…Studio Fritz (where my computer/office section is and where my Bernina Q20, named Fritz, sits), Studio Gibbs (where my main fabric, thread, and paint stash, my work tables, and my Bernina 830LE named Gibbs sits), and Studio Betsy (one small side of my bedroom where my Bernina 350 named E. Claire sits where my old Bernina 1230 named Betsy used to sit. I sold Betsy recently to my student and friend Anita). The chipmunk has taken up residence in Studio Gibbs (thank goodness not my bedroom!). So far, the only damage he’s done is knock things over and deposit chipmunk poop in places. The stash is safely in drawers and the closet where he can’t get to chew or soil and Gibbs is of no interest to him so far. I am soooooo hopeful of getting him out of there today. I have a live trap set for him and have tried multiple things, and am trying once more today with the trap and all. I need my studio back. I never had this happen before. Please pray for a successful removal of the chipmunk. Silly me, I name everything, even a chipmunk I may end up killing…this one is Chippy. I am so hopeful of not having to kill it to get it out of there. Sew happy everyone! You know you can get a basket like device to attach over your dryer vent so chipmunks can’t get in and chew holes in your dryer vent hose. My son just installed one on our house. I wish we had done it earlier!!!! 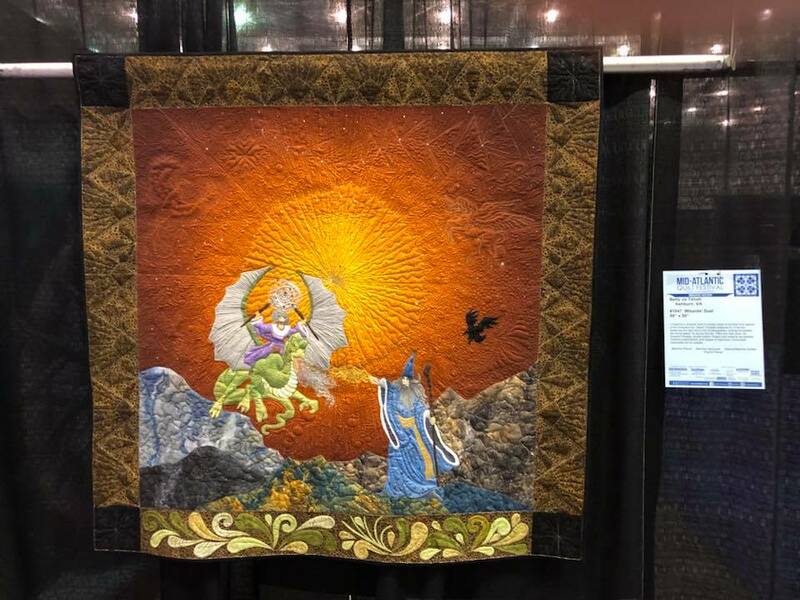 As many of you know, I am racing to meet a deadline for a show quilt for the Mid Atlantic Quilt Festival, a quilt I had not included in my business plan for 2018. In spite of a major mistake I made that required that I basically start over with the quilt, I have met my goal of getting the top complete and the quilt sandwiched and ready to quilt by Christmas. In fact, I started the quilting yesterday, but not before I installed a new interesting attachment on Fritz, my Bernina Q20 sit down longarm. It is a laser light pointer that puts a red laser light point exactly where the needle will come down. I gave this new attachment to myself for Christmas in celebration of my dear late husband Marvin. He always gave me the most wonderful presents. One of the ways I have learned to deal with Christmas since his passing fifteen years ago is to give myself a nice present as if it came from him. I miss him as much all these years later as I did the first Christmas after he passed. Strong, solid, reliable, loving, brilliant, and fun to be with was my Marvin. Sew I got my new show quilt all sandwiched with one layer of thin polyester batting and one of wool batting. 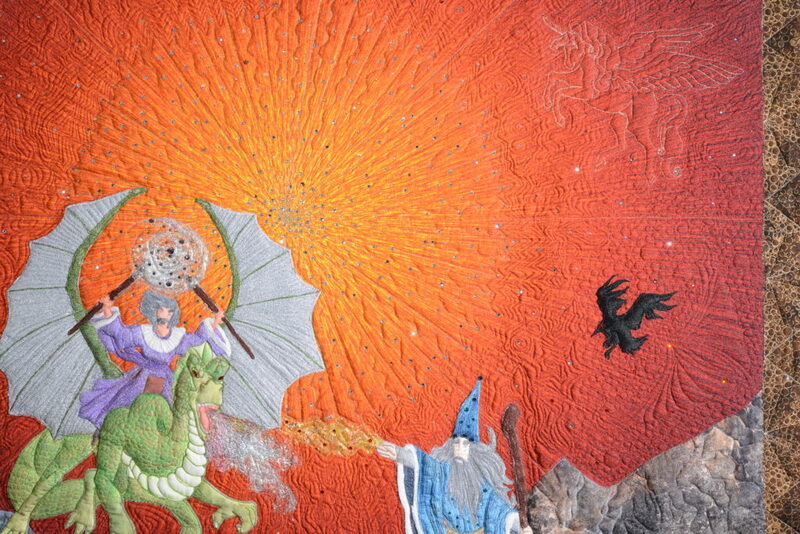 Using the newly-installed laser pointer, I spent most of yesterday afternoon and about five hours today quilting. I have a fair amount of appliques on this quilt and some challenging designs planned for the quilting. So far, I love the pin-pointer in mode 1 (on all the time I stitch), and Fritz is working like clockwork despite all the challenging threads I am throwing at it. 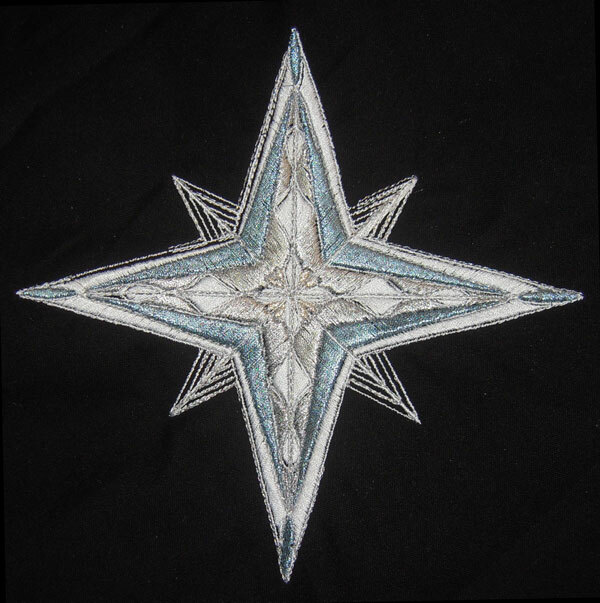 I started by stitching in the ditch and around the appliques (and no the star pictured at the top is not in the quilt) with Superior’s superb monopoly…so thin…so strong…nearly totally invisible and not very shiny like other monopolies. Truly, handling this thread is like I imagine sewing with spider webs or something equally hard would be, except it doesn’t break once you get all the tensions and needles correct (I used top tension 1.75, bobbin is Superior Bottom Line 60 wt polyester set at 180 tension, and an Organ 75/11 titanium embroidery needle). The laser light pointed the way. I was able to stitch amazingly accurately and extremely close around those appliques. I used the Q20’s BSR1 (stitch regulator mode 1) and the kickstarter that allows me to stitch without pressing the pedal. I love the kickstart. I didn’t at first, but now that I am really use to it, I use it nearly all the time for all the work I do at Fritz. I then did some detail work within one of the appliques that truly brought it to life, with the laser pointer aimed at the chalk marks I had marked on the applique. The monopoly was perfect for this, because I had painted the applique and free motion embroidered it. I did not want to impact the free motion embroidery but I did want to quilt in the trapunto. I had added an extra layer of wool batting behind the applique to give it that trapunto fill. I am very happy with it. I haven’t yet done the detail for any of the other appliques. So I then switched to metallic thread. Metallics are known to be troublesome, but today Fritz was happy to play. The metallic stitching I have done so far was just plain wonderful. It is ruler work, stitching along several long marked lines. The laser pointer works great with ruler work, pointing exactly where the stitch will go, so lining up that quarter inch, which is sometimes a little elusive, is no problem at all. However I did find that the #72 ruler foot works better with the laser pointer than the #96. The 96 has a diagonal fill in the center to help you place the needle that makes the laser point difficult to see if you are not leaning over it more than I do. The 72 has an empty center, and that works just great. For ruler work I use the BSR2 (stitch regulator designed for ruler work that moves when you move and stops when you stop, but sometimes it will take a stitch if it detects even a small amount of movement). For metallic thread I set a top tension of 2.5, and use Bottom Line with the same 180 tension. I also thread it so it runs across that little silicone liquid pad thingy. In fact, I did that for both threads. Sew my next challenge for the laser pointer light and Fritz are the complex pictographs I have to quilt on the quilt. At least one of them will be stitched in metallics. Then I still have to decide how I am going to stitch the background…I have an idea developing, but it will be a big challenge for me. Still, if I can carry it off, I think it will be a wonderful quilt. It’s so very much fun though. I really recommend the laser light pointer and the use of the kickstarter if you have a Q20. I also bought the echo circle attachments for the #72 foot that I am planning on using on this quilt. I’ll give a review of their use when I get to that. Sew happy everyone! Try something new and don’t be discouraged if you have to spend some time learning it. Merry Christmas to all and to all a good night. Oh, did I tell you? They have a new pin point laser light attachment for Fritz that shows exactly where the needle will enter the fabric to help with precision quilting and free motion thread work. Awesome! I ordered one (they had a 25 percent off offer). LOL I need all the help I can get making my quilting sing. Last week, I also updated my Electric Quilt to EQ8 (they had a great offer). Sew now that we have clearly established that I spend too much on my super hobby and I make too little with it, I keep thinking how I can turn this situation around and start making at least enough to support my quilt-making habit, and even have some for trips to places like Houston or Paducah for the big shows. For example, I just updated my website gallery last week so you can see my quilts better and see what the sizes and prices are for those that are on sale. By the way, the exhibit of my quilts is still going on at G Street Fabrics in Rockville, Maryland, where most, not all, of my quilts are on display through Thanksgiving if you have a chance to go. Most of you probably know I am a Bernina girl. I love Berninas. 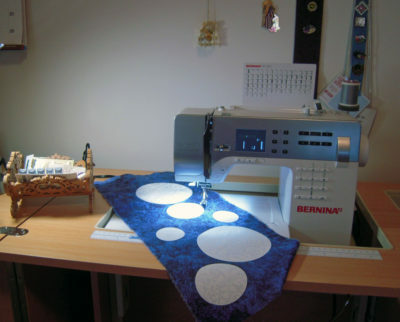 I have four of them right now, but I am selling my Bernina 1230 to my student/apprentice, Anita is one of my best friends, a true beginning quilter, and I am teaching her to quilt and improve her sewing, and to use the 1230 all just for fun. I also have a Baby Lock Serger (yes, really!!!). Now I reluctantly admit that Baby Lock is also a very good brand, and they make wonderful sergers. If I had to choose a machine other than Bernina, it would probably be Baby Lock. I have really neat plans for 2018. I have several quilts already started or close to being started, and I am writing a couple of books on art quilting and I hope Anita will be my beginner beta tester of the projects in the book once I get her started. My daughter in law Beth, who is an advanced quilter with a fabulous studio, will be my advanced beta tester. Additionally, I am working out a few workshops for local teaching, but I seldom really make any money to speak of on those because it takes so much time for me to get them pulled together. Maybe eventually those will make money too. I really do them to learn what people want to know and am putting that in my books. So they are still valuable to me. Sew maybe 2018 will be my year…I’ll go through a whole year without updating any software or buying any new machines, start selling more quilts, win more and better cash award ribbons, and finish my two books which will, of course, each be a major hit and sell, sell, sell. Ha-ha-ha-ha,,,,,,,,In the meantime, however, I plan on continuing to thoroughly enjoy my fleet of machines and suite of drawing and design software and endeavor to rein in my desire to have the very latest machines, attachments, and software. We just won’t mention “adjustments” to my stash of fabrics, threads, yarns, beads, and paints here. But they are necessary, right? Sew happy everyone. I hope you have a play space you enjoy. Believe it or not, I have completed all my projects I had going. Now that the workshop at G Street Fabrics is over (I will be repeating it in the fall), I am going to make two quilts centered around two digital printouts. I’m hoping to get one of them done by mid July for part two of my Exhibit at G Street Fabrics. The pink flowers I painted in Corel Painter 17 and had it printed. I painted this one digitally in Corel Painter 17 and had it printed 28″ x 38″. They came out really wonderful, and I washed them in Synthrapol, rinsing until they ran clear. There wasn’t much color in the first batch of water and I can’t see any color loss. So now I can use them in a quilt I will soak when the quilting is complete, which makes marking things and blocking a lot easier. I’ll have some embellishments I will add after blocking. I plan on just sandwiching and quilting the field of flowers photo with a variety of threads for depth and interest and adding beadwork and some 3D embroidered butterflies. I might face it instead of binding it. Bernina V7 software to applique on. This is my bigger project, as you might imagine. If this turns out well, this might be a show quilt, but we’ll see. In the meantime, I have broken down my housecleaning project into small manageable sections and am spreading them out across a couple of weeks. I did pretty well with this so far. My upper level is mostly clean, though I have a plan to go through my stash at some point, eliminating some things and slightly reorganizing the fabrics so they all fit back into my storage units. I’ll do this later, after the mid-July deadline for the second part of my G Street Fabrics exhibit. I’ll do the main level next week, and David will do his level too (he has a nice “flat” on the walkout lower level that includes his bedroom/office and a nice big living area with his own back deck. There is a bathroom area that has the rough in plumbing, but I haven’t gotten it finished yet. Maybe if he has a big hit book, he will do that himself.). 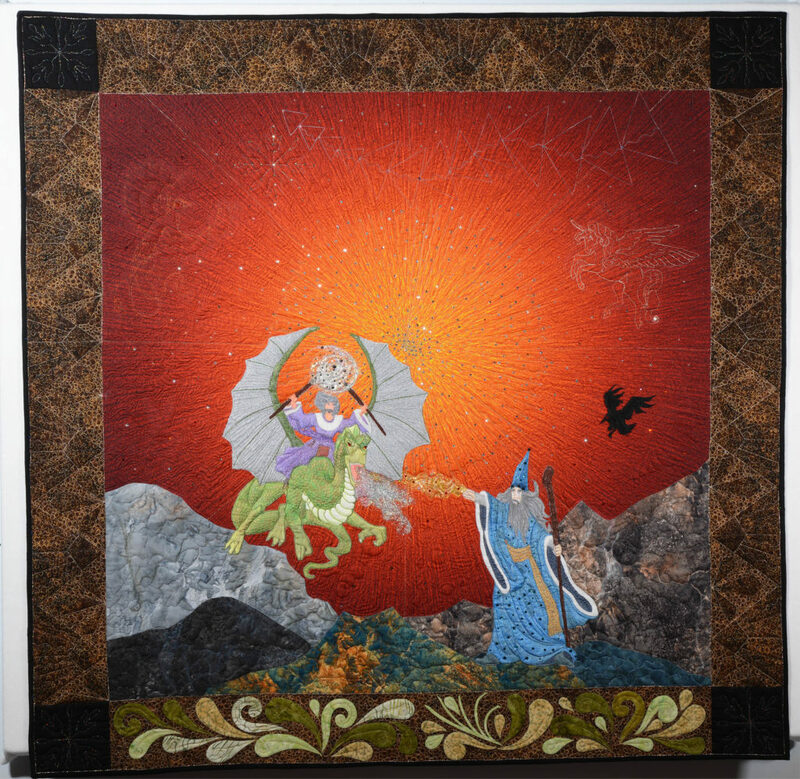 A word about digital fabric art: It is NOT “cheating” as some quilters seem to think. 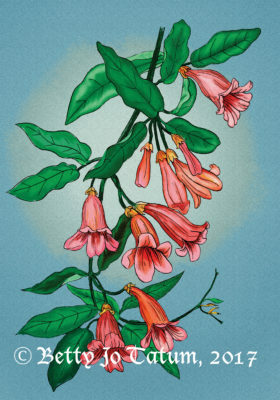 For example, it took me s lot of time to paint the pink flowers, and they are fully my own artwork. Why would that be any less of a “legitimate” quilt than a whole cloth, for instance? Neither would a photograph that is printed, sandwiched, and quilted as a whole cloth. I do think there is slightly greater acceptance of the value of digitally printed fabrics than there used to be. And that is good. Indeed, am hopeful some of the heated rhetoric about just about everything these days will cool off. Let’s appreciate one another and their work…traditional, contemporary, modern, and art quilters, white collar and blue collar workers, sharing their Mom’s house while writing wonderful stories for the world to enjoy, making art quilts, plumbing the kitchen, powerwashing your home, managing a business, Democrat, Republican, Independent…cool it everyone. Life can be wonderful and full of peace and love if we stop the arrogance and heated rhetoric and take a step back to love and appreciation that we are not all-knowing. Sew happy everyone! 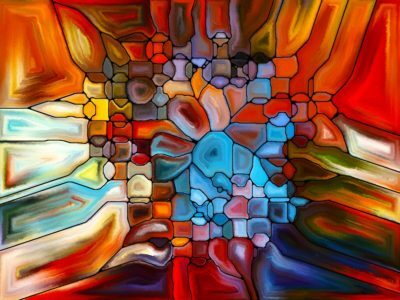 Try your hand at making some digital fabric art if you haven’t tried it yet. I’ll post more on these projects along the way. 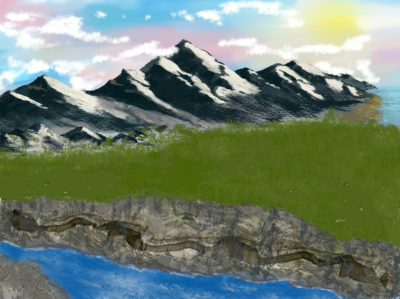 Also, I have decided to put the landscape project I tried to start as a kind of block of the month on the backburner. It needs more definition, and everyone that responded said they were too busy. I think I am too busy too…LOL. 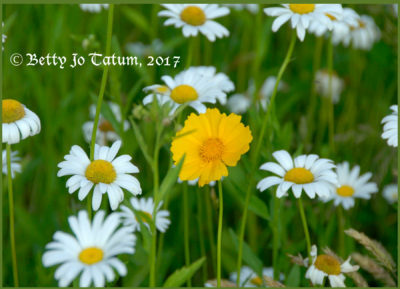 Tags: Digital work, Encourage new sewists and quilters, Having fun in my studio, I love comments., Thank the Lord for all the cool things we have to work with today, What is that crazy B.J. doing now? I am astonished to see that it has been nearly a month since I published my last blog post. In general, I try to publish once a week every weekend, but sometimes I get caught in that time vortex where each week is but a day and each day but an hour…you know the ones I mean. I am just bobbing my head up from the latest whirl as I prepare for Christmas and work to complete some deadlines. I am waiting on a wish list from my most difficult of all family members to buy a gift for (my oldest son Ken), and if he doesn’t give me one he gets a gift cirtificate. But other than that I have completed my Christmas shopping. I have not yet even started decorating for Christmas. I celebrate Christmas, the birth of my Lord, from Christmas Eve through 6 January. I also celebrate Advent as a time of preparation and reflection. So for me, having the house decorated by about December 20th or so is just about right and in tune with the preparation part of Advent. Yet, the other night I was driving home from being out and saw my whole neighborhood is bright with beautiful Christmas lights. So I think for my neighbors we will endeavor to get our outdoor lights up this week. My youngest son, David, is under a heavy set of deadlines for his writing. He has been asked to contribute a novelette for a collection of stories that is due by the end of the month, and he has to get it to his editor by the 15th. So I am putting off decorating until he gets that manuscript to his editor. He is a necessary part of this endeavor. After all, someone has to go up that ladder to get the decorations down…LOL. He also has been asked to be a guest author at a writing/fantasy/sci fi conference (Raven Con in Williamsburg, Virginia) in April, and he has the third book in his Law of Swords series close enough to completion that he wants to get that one published in time to have it in hand for the conference. So snatching a bit of his time here and there is really difficult. But I’m excited for him. His writing is downright magical. If you haven’t read any of his books, I encourage you to do so even if you don’t normally read fantasy, because they are full of romance, intrigue, and adventure and are so very well written. They would make great Christmas presents too, and talent as deep and wonderful as his is needs supporting. So please buy a book and see what you think. I have not forgotten the blog this past month. 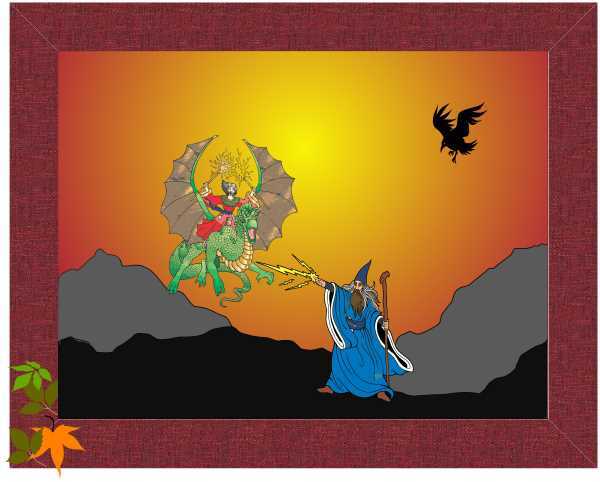 I have been struggling to write a post about the magic of combining today’s wonderful drawing and painting software with fabric art and specifically with art quilting. But I think I’m going to put that one aside because I just can’t get it put together like I want. But believe me, it’s worth the time and money spent to obtain and learn such technologies as Corel Draw, Corel Painter, Bernina Design software, Electric Quilt, and any photographic editing software. With it, you can paint in the computer and print on fabric. You can design in the computer and print a full sized design. You can design your own fabric and have it printed. You can draw a whole quilt and have it printed full sized on wonderful fabric and quilt it. You can digitize your own embroidery items and stitch it out on your embroidery machine. 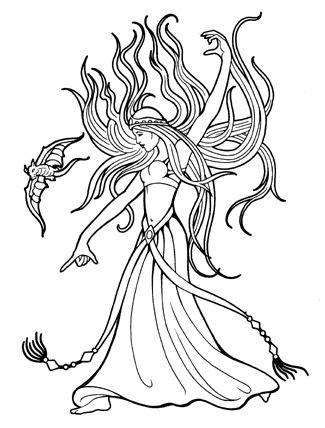 You can just draw something wonderful and print it out full size and replicate it on your free motion machine (even a treadle machine if that’s how you roll). It’s so exciting and wonderful that it’s almost magical. And so what are my deadlines, you wonder. Ahhhhh….that’s a good question! Maybe I’ll tell you some of them next time. Sew happy everyone! I bet you have some kind of artistic software lurking around your computer somewhere. It’s time to learn to use it if you haven’t already as part of your quilting and/or sewing adventure. Tags: Buy David's new book and you will have a fun read, Don't give up without trying something else first, Encourage new sewists and quilters, I love comments., I love these high tech tools, I must be crazy, I'd only need to buy a new needle every now and then, What is that crazy B.J. doing now? This will be the last blog post I write on making Ken’s special quilt until it is completed, and probably until after it has been debuted at some show in order to keep it for a surprise, but I wanted to tell you how I was solving the border problems. I will write the posts, but not publish them until then. I will, of course, continue writing blog posts about other topics. I have been kind of concerned about whether or not I could get the border right for the quilt my son Ken designed for me. It uses complex Celtic knots and designs. So this week I managed to get all but one of the corners digitized and tested to stitch in-the-hoop at my Bernina 830 LE (Gibbs). 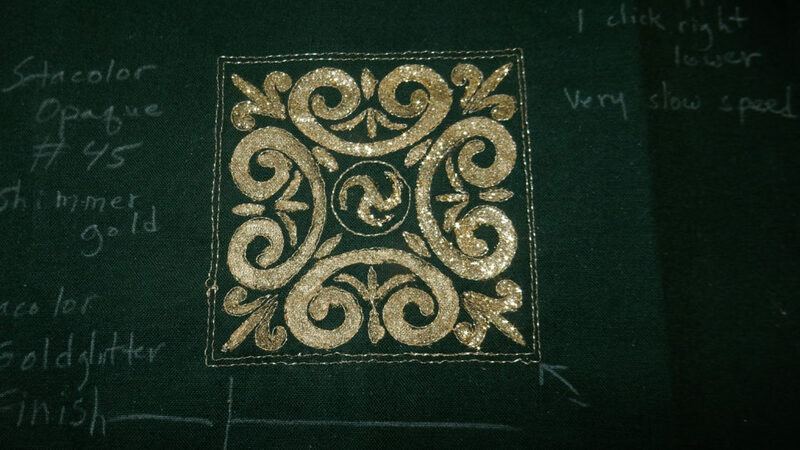 While working in the embroidery module, Gibbs rebelled over most of my gold metallic threads, finally accepting Superior metallic. With some testing and fussing with tensions and needles, coupled with slowing way down to nearly the slowest speed, it decided to stitch out my designs without any further tantrums. But I don’t much like the way the thread looks, so I am going to test some near-metallic colored threads. After all, this is the outline for painting the design with Setacolor gold paint and finishing with Setacolor Gold Glitter Finish. I have used these paints for several years now on my show quilts and they are permanent once dried and heat set. I’ve even washed them with success. The glitter may need a little refreshment after a couple of years of shipping, folding, showing, folding, shipping, but the underlying gold stays solid and most of the glitter is still there even so. I’m fairly certain with ordinary hanging in one’s home or office, and an occasional light vacuuming with a cheesecloth over the end of the vacuum hose, these paints will last for decades. This is my first test of stitchout 1…small right corners. Here you can probably see that I have only half of the block finished with glitter paint for comparison. It seems the right finish to me. But I am not happy with the metallic threads here. My biggest problem was getting the long designs on the border that were too big to fit into a hoop and that I thought were too exacting to manage a good multi-hooping of the many hoops required. So I decided to see if I could get the outline stitching done with good marking and free motion/ruler work on my new sit-down longarm Bernina Q20 (Fritz). Fritz is a dream. Fritz does not dislike any of my metallic threads. Neither does Gibbs, for that matter, if it isn’t working in-the-hoop. But I practiced on Fritz this time in non-metallics. Oh my….I set it up in BSR2, which Bernina recommends for ruler work. Using 7 of Lisa Calle’s wonderful rulers, I have done some practice work. While I need more practice, I am fairly certain by now that I can make these border pieces. I have found that Fritz can place each stitch where I want it…it will slow way down, work at higher speed, stop when I stop and start when I start, and all controlled only by how I move the fabric when it’s set on BSR2. I will note that this can also be done at most any sit-down sewing machine, although perhaps not as easily. I am pre-stitching the designs, not quilting them in. I will quilt them after sandwiching the quilt, and will use either Superior’s monopoly or 100 weight silk matching the backgrounds. 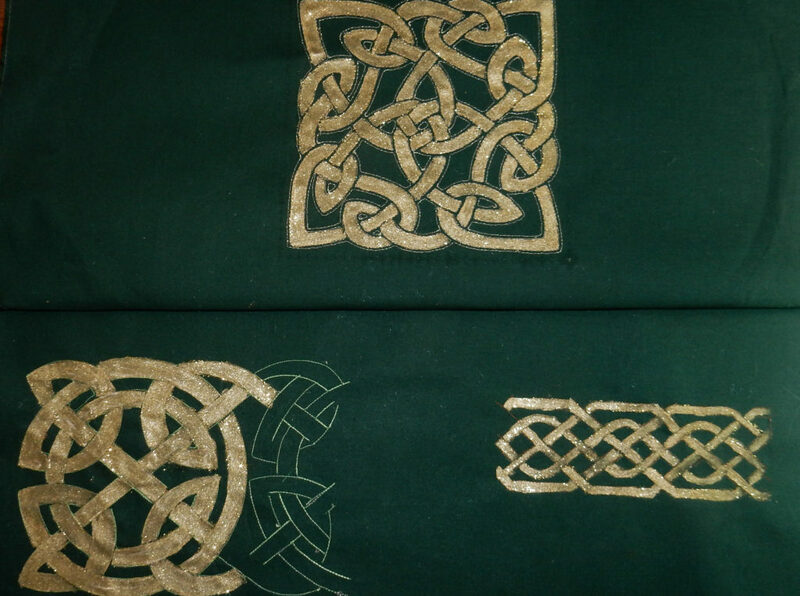 This will provide further definition to where the design goes over and under to make the Celtic knots. So I starched and then backed my test pieces with my favorite stabilizer for embroidery (for that is what this is). That is Madeira Cotton Stable, which has a light fusible on it, and is 100 percent cotton. Thereby no hooping is necessary. This stabilizer can either remain in the border or tear out. I usually tear out most of it and don’t worry about getting absolutely everything before sandwiching. The top corner design was done with Gibbs in the hoop and then painted. The lower left and right designs were done using rulers and the Bernina #96 ruler foot with Fritz and then painted. I left unpainted some of the stitching on the lower left so you can see how it looks before painting. It needs practice. I still have to complete the digitizing of the one big upper left block, and when I finish and test that, and dye my PFD Radiance a dark green (which kind of makes me nervous, but they don’t make it the color I want), I will FINALLY be ready to start actually making the quilt top. Sew happy everyone! I hope you are having a wonderful weekend. God’s blessings. Tags: Buy David's new book and you will have a fun read, Having fun in my studio, I love comments., I must be crazy, What is that crazy B.J. doing now?